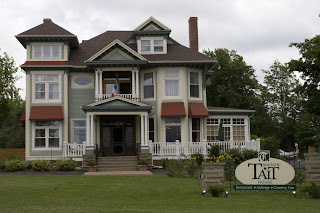 Today we visited the city of Quebec in the morning which is just across the river from Levis. 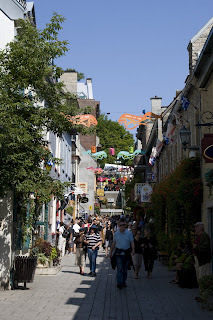 It was quite busy in Quebec as the weather was marvellous and Quebec it celebrating its 400th anniversary this year. We strolled throught Old Quebec and again were impressed by the wonderful houses (we already visited Quebec last year, but then it was raining heavily). 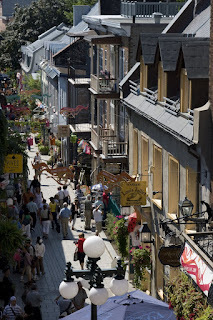 In Old Quebec you can find numerous little shops and restaurants. 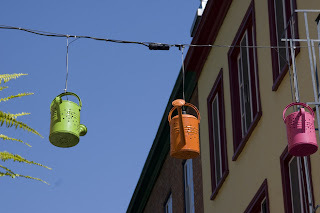 For the 400th birthday the streets and houses have been decorated. 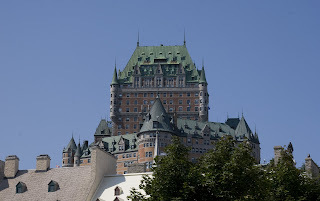 We started our visit with the Lower Town and then climbed to the Upper Town where the Fairmont Le Château Frontenac is overlooking everything. Quebec is the only city in North America which has preserved its ramparts and has thus been declared a UNESCO world heritage site. Due to the 400th anniversary parts of the old fort are accessible to the public. 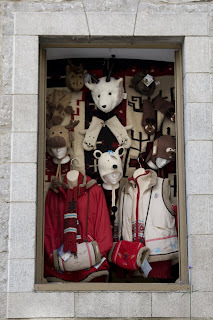 After visiting Quebec we drove to Laval which is located near Montreal and did some great shopping there. We then had dinner (Japanese Fondue) at Mikasa Sushi in Laval - it really was delicious. 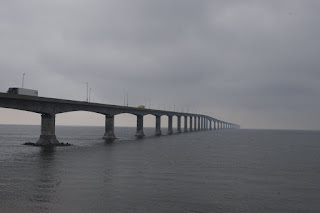 This will be the last blog entry for this journey as our vacation is almost over. Today we will only drive from Montreal to Toronto to catch our flight in the late evening. 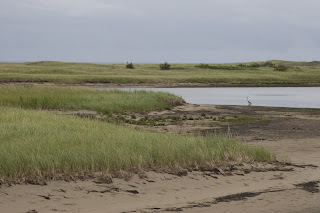 Today we crossed the Gaspe Peninsula and visited the Parc National de la Gaspesie. 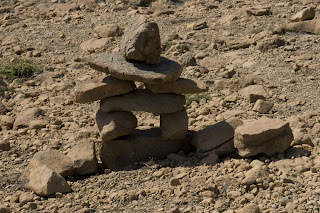 We learned that there are two different kinds of national parks in Quebec. National Parks operatated by Parc Canada and Quebec National Parks which are more like provincial parks. 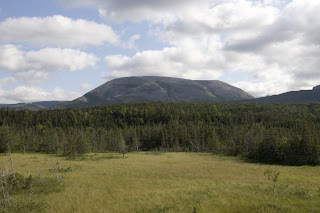 The Parc National de la Gaspesie belongs to the second category. 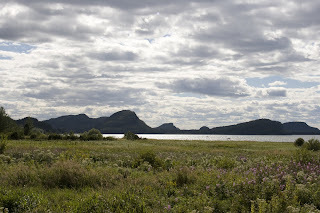 To get an impression of the park we visited the interpretation center and did a wonderful hike. 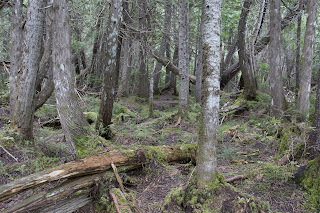 I enjoyed the hike a lot as it brought us into a real old-grown forest which you cannot see often anymore. 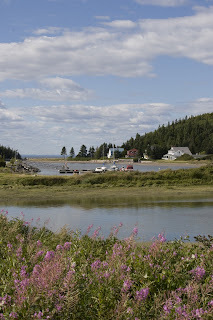 Our drive also allowed us to get a good impression of the north coast of the Gaspe Peninsula. 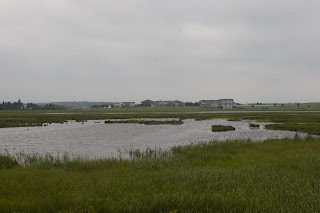 Though some of the places are very beautiful, several villages along the north shore provide a strange mixture of nice houses and ugly, big shopping facilities. 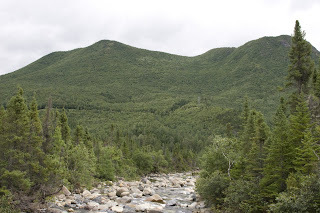 We also passed Bic National Park (again a Quebec National Park) on our way to Levis near Quebec. 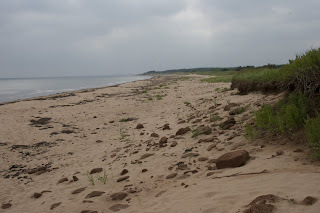 Today we visited the remaining parts of the Prince Edward Island National Park and took several pictures along the way. 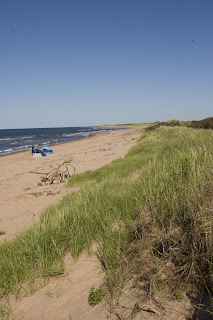 PEI National Park is not very big in size, but is rather a narrow strip along the coast providing good opportunities for swimmin, hiking and biking. 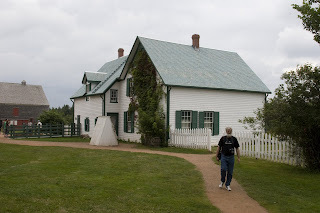 We also visited the Green Gables National Historic Site - you might know the famous book "Anne of Green Gables". Though Anne is only an imaginary character some of the places described in the book like the Green Gables farm or the Lovers Lane are real. 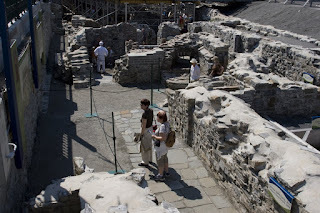 We were amazed by the huge crowd of people visiting this place. No other attraction we visited on our trip was so crowded! 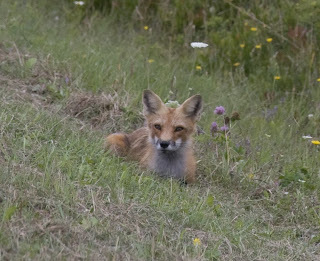 On our way out of the park we spotted this red fox just next to the road. 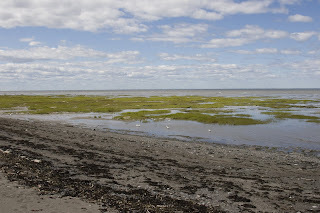 In Shediac, New Brunswick we made a short lunch break. 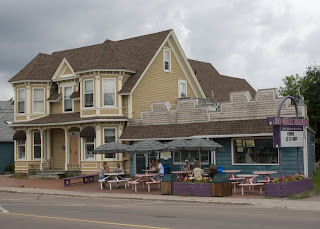 Shediac is a small village with French influence and you can see many beautiful houses along the streets. 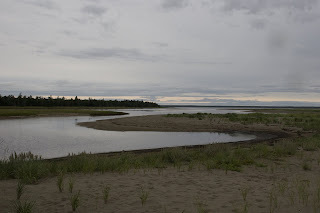 On our way to Campbellton we also passed Kouchibouguak National Park which has similar characteristics as PEI National Park. 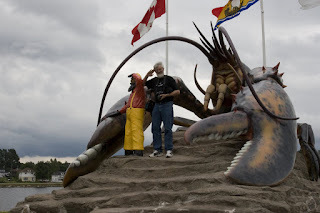 By today we visited all Atlantic Provinces (Quebec, New Foundland and Labrador, Novia Scotia, Prince Edward Island and New Brunswick) on this journey. 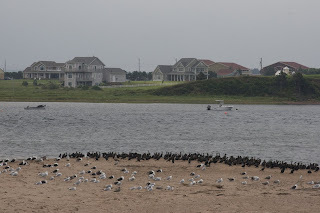 Today we took the ferry from New Glasgow (Novia Scotia) to Prince Edward Island (PEI). Initially, we planned to take the 9:30 ferry (which was supposed to be the first one). As the ferry does not take any reservations we were told to be there at least 1 hr in advance. When we came to the ferry terminal we saw that there was an earlier ferry just being loaded and we got the last place on it :-). 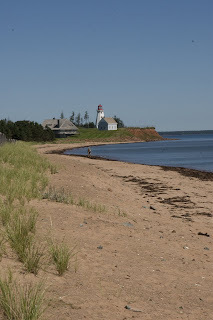 After 75 minutes we arrived at PEI and decided to take the Points East Coastal Drive. 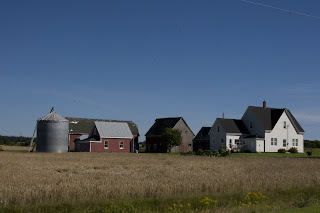 At PEI farming seems to be quite an industry as you can see farmhouses all over the island. Along the drive we did several stops at scenic places. At Montague we booked a seal cruise which turned out to be a good decision. 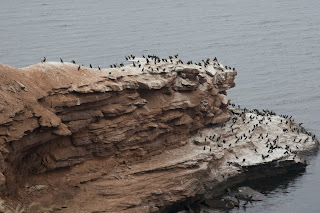 On the tour we did not only see seals, but also learnt quite a lot about the region. 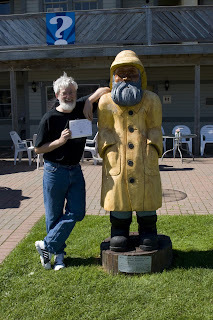 Most interesting for us was to learn about the mussle farms at PEI. 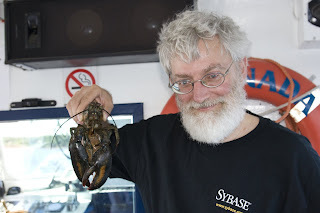 We were quite amazed to hear that mussle farms are a huge business at PEI, about 26 million dollars just last year. Mussle farms are quite a new invention and go back to a Belgium immigrant who started this business about 30 years ago. Baby mussles are put into a "mussle sock" and hang from a mussle buoy. Usually, mussle buoys are organized in lines of about 100 buoys. The mussles usually need 2-3 years to grow to their full size. Each line results in about 5000 pounds of mussles. We were surprised to learn that starfish are the biggest predators of mussles, especially the small starfish which are small enough to get into the mussle socks. As one starfish can eat 50 pounds of mussles a year (and there are many of them in PEI's waters) they are not really a fisherman's friend. To protect mussles from being eaten by starfish fishermen apply lime to the mussle socks. Ready for dinner - On the boat tour they also showed us how lobsters are caught. 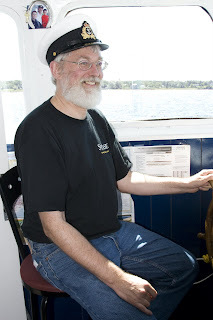 On the way back the crew looked for volunteers to steer the boat. Werner with his "Captain Certificate". On the boat tour we could also see a lot of beautiful houses along the coast and we were totally amazed how cheap houses are on PEI. 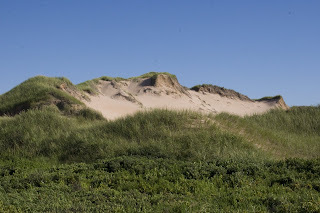 After this very interesting tour we visited Prince Edward Island National Park at Greenwich. To get an overview of the park we first checked with the Visitor Center, watched a movie and went through the exhibits. We then did two nice hikes in the park. 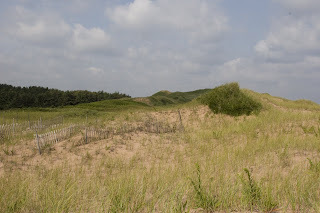 One of them brought us to the parabolic sanddunes which you rarely find on the island. 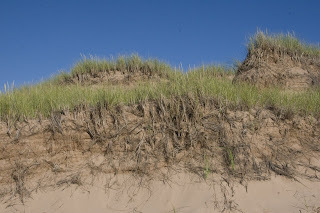 Without the marram grass stabilizing the sand dunes they would be blown away by the wind. 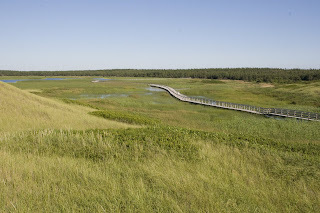 The second trail provided us with a good view of St. Peter's Bay. 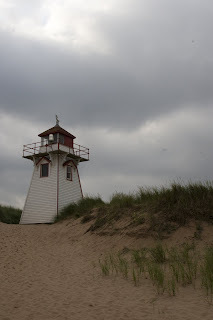 We then drove to Charlottetown where we stayed overnight. 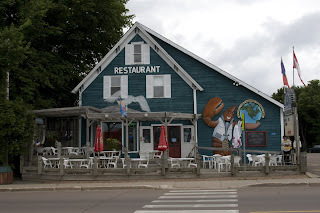 We had an excellent seafood dinner with mussles and a lobster at Flex Mussles restaurant at the wharf. 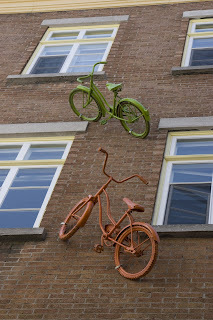 Today's blog entry is very short as there is not much exciting to report. 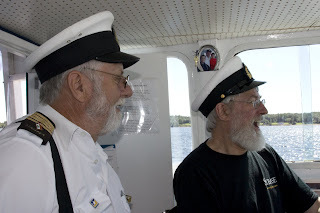 Most of the day we spent on the ferry "Leif Ericsson" from Port-aux-Basque (New Foundland) to North Sydney (Novia Scotia). As there was again free WIFI the time passed very quickly and I could make most of the arrangements for my next journey :-). I also found time to finish reading the book "Lure of the Labrador Wild" by Dillon Wallace which is said to be sold in every gift store in Labrador and also seems to be in almost every household. 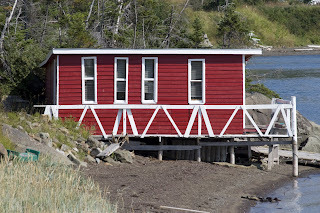 The book is about an expedition which started in 1903 to explore central Labrador. 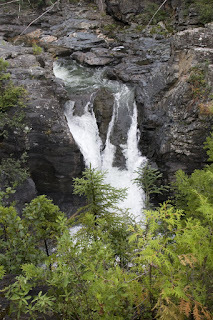 Inexperience and a mapping error led Leonidas Hubbard, Dillon Wallace, and George Elson take the wrong river resulting in a much longer and more strenous journey than intended. Due to the approaching winter and inadequate food supplies they had to give up and turn around, but too late as Leonidas Hubbard died on the way back from starvation. 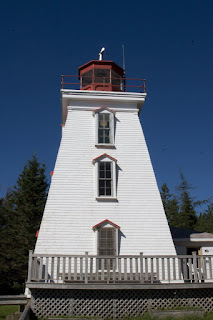 At 17:30 we arrived in North Sydney and had to drive for two and a half hours to reach New Glasgow. Todoay we visited the Tablelands and already the drive to get there was very scenic. 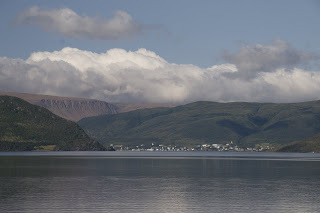 This picture shows Bonny Bay (foreground) and the Tablelands (background). 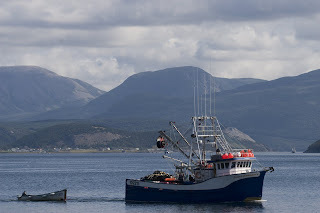 Picture of Gros Morne mountain which gave the National Park its name. 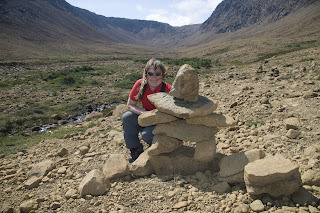 Initially we planned to hike Gros Morne to get a breath-taking view of the park, but had to change our plans due to uncertain weather conditions. 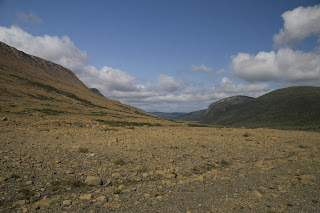 The Tablelands are very distinct from all other parts of Gros Morne National Park. 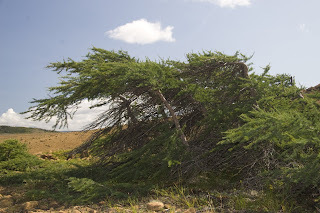 They can be characterized as a are a barren dessert which due to their low amount of calcium, high amount of magnesium and their toxic amount of heavy metals (i.e., nickel) is very hostile to most of life. 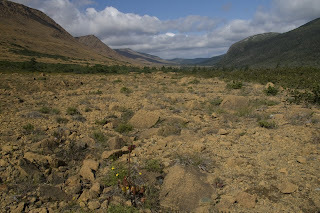 The Tablelands themselves originate from the Earth's mantle and were created several hundred million years ago as a result of plate collissions. 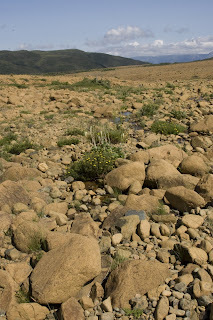 You can see dwarfted flowers and dwarfted trees (Krummholz) in the Tablelands. The trees there are with almost 300 years much older than the ones in all the rest of the park. 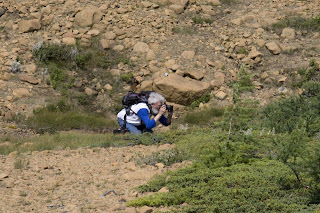 Werner chasing for good pictures of the Krummholz. 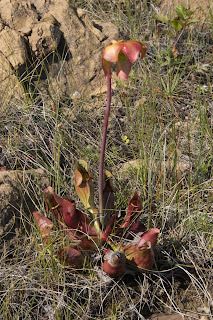 The tablelands are not as dry as they might appear to you and you can see pitcher plants and sun dews almost everywhere along the trail. 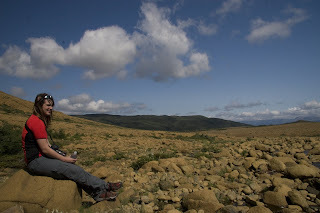 After a marvellous hike in the Tablelands we visited the Discovery Center on the south side of Bonny Bay. The exhibits very still pretty much the same as at our last visit in 2004 and we therefore went through them quite quickly. However, there was a particular exhibit which drew our attention as it explains the typical work of different researchers like geologists, botanists, archeologists, marine biologists etc. 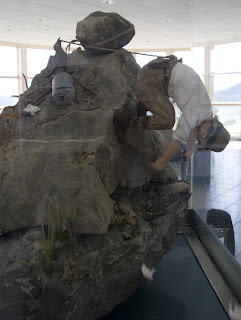 Below you can see a very neat picture of a botanist at work. 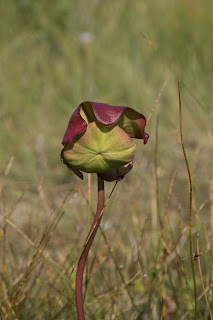 Those of you who know the botanist in my family probably will agree that this picture is really typical.